If you ever wondered how Torbjörn lost his arm, why Reinhardt would be considered close enough to be invited to the family Christmas, or what “White Dome” had to do with either, now you can find out with the latest update from the Overwatch lore archives. We discussed already the recent teaser about White Dome and how it might mean we’d be getting a new, maybe Turkish hero. Now, the story archive has presented us with a letter from Torbjörn to his pregnant wife that followed the operation. The original is written in Swedish, but thankfully for those of us who do not read that language there’s a translation that has people thinking that there may soon be another Lindholm on the playable hero roster. 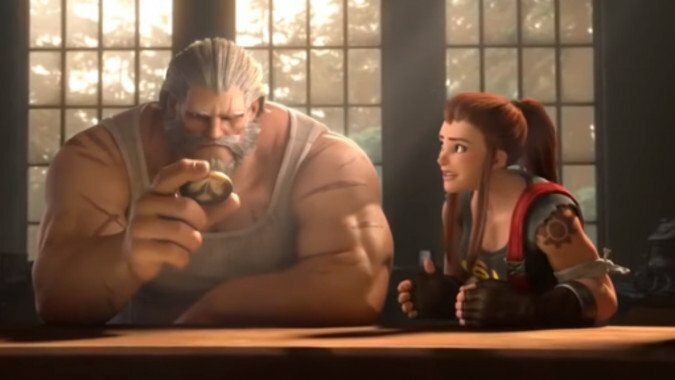 We also find out that Reinhardt is Brigitte Lindholm’s godfather in no small part due to his having saved Torbjörn’s life during “White Dome” as well as his having annoyed the everloving heck out of the man until he half-jokingly promised that Reinhardt could name his first child. Since Brigitte is that first child of Torbjörn and his wife Ingrid, it seems likely that Reinhardt named her, although the fact that Torbjörn promises Ingrid she gets veto power over anything Reinhardt proposes is probably why her first name isn’t something a trifle too extravagant. Now, a lot of people — including some folks around here — suspect that this might be a teaser of sorts towards the possibility that we’re getting Brigitte as a playable hero. Or maybe it’s more fair to say that we want to see Brigitte as playable, and we’ll grasp at any straws to justify this. But seeing the Torbjörn letter certainly seems to be a hint in her direction to me. Read the complete text of the letter below and decide for yourself. Update: Blizzard just posted a new teaser image on Twitter. We want Brigitte.